Algae growth causes a brown-to-black discoloration that results in a streaked, dirty-looking rooftop. It is caused by the growth of airborne algae, which deposits on your roof. The good news is that algae growth does not affect the service life of your roofing material. Blistering is caused by moisture in the shingle. The best solution is to replace the shingles as soon as possible. Buckling can have many causes, including (1) improperly applied felt, (2) wrinkled underlayment, (3) roof deck movement, (4) spacers not used in between roof deck boards, (5) poor roof ventilation and (6) new shingles applied over rough, old shingles. Curling can result from a variety of problems, including (1) high nails, (2) a lack of back coating, (3) under-saturation of the asphalt felt in organic shingles, (4) a lack of ventilation and (5) an improper number of fasteners. be seen missing on the surface of the shingles, thus exposing the asphalt or fiberglass mat. 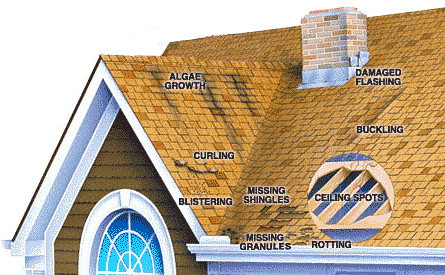 Missing shingles typically result from either improper fastening or exposure to high winds. To prevent further damage, this issue should be addressed as soon as possible. Rotting is caused by absorption of moisture by the mat at the core of the shingle. This is a common problem with organic-based shingles, with the best solution being replacement with a fiberglass shingle. Spots are caused by leaks in the roof - areas to check include (1) the attic for leaks in the deck, (2) the chimney and vents for cracks in the flashing, (3) the rafters for leaks that "travel" away from the original source, (4) eaves for water backing up from ice dams and (5) the roof for damaged shingles.